All through the month of June, my partner and I are creating a dating sim for the International Love Ultimatum Gamejam (#ilujam on Twitter and Tumblr). Want to know what goes into making a video game? I’ll be posting weekly updates in a structured development blog here. Yeah, you can hand-code a game. Or you can manipulate some tools in an innovative way to create a beautiful game: here’s a choose your own adventure game built entirely in @replies on Twitter, and ChoiceScript allows writers to create games that behave like multiple choice tests. Other games are built on code bases called engines; some popular ones for #ilujam and other visual novels include Ren’Py and TyranoBuilder (and htmlVN, the engine that Beach Island is built in). The landscape is changing. Unity and Unreal, two powerful game engines, are now available for free, making game development accessible to more than the boys-club game studios that can afford them. Tools are becoming more user-friendly, favoring storytelling and scene development over learning a niche programming language. Creators—men and women—can hone their skills to prepare for mainstream game industry jobs or develop beautiful indie games on their own time, with cutting-edge technology. The message is clear: anyone can make games, at any stage of their lives, and coding is no longer a hurdle that game creators need to vault. That being said, I did not write the code that powers Beach Island! For that, I turned to Conrad Kreyling, founder and technical lead for Date Nighto. Jo: We’ve had a lot of conversations about game development, and you have a lengthy history making games. As a developer, where do you think your job ends, and what happens in that estuary between the technical and the creative? Conrad: What’s important for me, and what I’ve tried to bring to the table, is giving creative people the tools and support they need and otherwise staying out of their way. Sometimes this can entail more involvement on my part, say with UI/UX advice, but other times the creators of a project have a super clear vision for how they want the game to work, so I’m happy to just give them technical support and get the job done. Jo: So, what does it take to be a good games developer? Is there a specific kind of person who excels at this kind of work? Conrad: Hilariously, I don’t believe myself to be a particularly good games developer! If anything, I find the act of making games with really precise mechanics, like platformers or shooters, to be really tedious and fiddly. I like to be more involved in “simpler” story-driven games, where characters and narrative can drive play rather than what combination of parts has broken the shotgun this week. You just have to be passionate about making a great product and you have to keep your users first and foremost. The good news is: games are extremely multidisciplinary. You can be focused on (almost) any programming discipline and find a space in games. I took HTML knowledge I learned while making websites and email newsletters to pay for college and turned it into htmlVN; you can definitely take the skills you have and apply them to games! You just have to be passionate about making a great product and you have to keep your users first and foremost. Jo: Let’s talk Beach Island specifically! Because we’re a two-person team, we’ve both had to shoulder some responsibilities that we’re not entirely used to. My comical attempt at drawing game sprites will be on display when we launch our game. What’s been the hardest task for you, and what’s been the most fun part of participating in #ilujam? Conrad: So I’m not much of an artist; in fact, I’ve attended a life drawing class for exactly thirty minutes, exactly once. So, when I was assigned the backgrounds, I kinda knew that it was going to be a rough patch for me. Also, while I like doing UX design, I’m not good at the actual pen-to-paper act of creating a user interface, so there were some fun iterations on just completely unusable designs and just the ugliest textbox you’ve ever seen. Fortunately, Lindsay (from the last jam diary!) swept in and rescued me, providing me some (super) necessary direction. The most fun part was writing the Twine parser for htmlVN, hands down. I haven’t written a parser since I was in college, so the act of rediscovering how to efficiently parse text files (and how to report errors back to the user!) was a blast for me. Even better: now you can write htmlVN games in Twine! Any development, and game development in particular, is user-centric. As a software tester and product manager at my day jobs, I’ve encountered developers who are obsessed with product and forget that at some point humans have to interact with it. It’s like those old bauhaus architects who designed these perfectly functional apartment buildings—with no bathrooms. Our priority for Beach Island was always usability: relatable characters, art that makes an emotional connection, and a user interface and code base that doesn’t invade the story of the game. 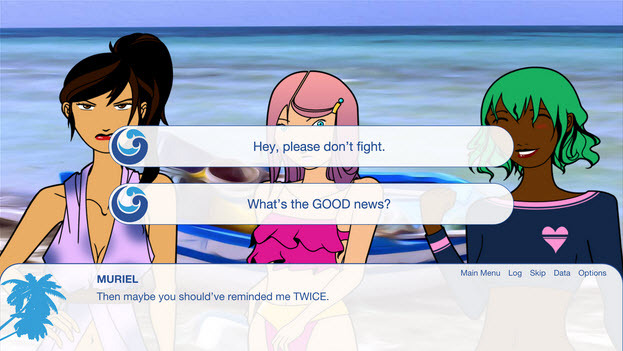 As of this interview’s publication, our efforts have come to fruition: you can play Beach Island and other fantastic dating sims created in a month right now on the #ilujam website. Or hey, here’s a direct link to our game! In the meantime, here are some screenshots of the work we put together. Read the rest of the How to Make a Dating Sim in a Month series.